Trevor Marshall): Where do you plan to sail her? Ok, we've already stated the fact that I LOVE b-movies. A lot of them are cheesy, badly acted, and have horrible plots. But that's what I love about them. And surely this film has all those right elements for a b-movie. But what this film does better than those other films, is that I manages to maintain atmospheric. Some of the scenes in this film were absolutely frightening! It kept me spellbound and wondering what was going to happen next. Even though, it was blatantly obvious and predictable. It still kept me guessing at certain parts. I give it a 9. Watch it if you are a die-hard horror fan or b-movie fan. 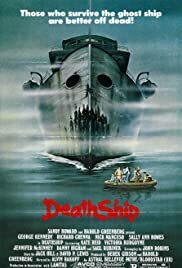 Oh yeah, George Kennedy actually gave an award winning, creepy performance as the captain who wanted to take over the Nazi Freighter.